Researchers from the laboratory of Majlinda Lako (Newcastle University, Newcastle-upon-Tyne, UK) have previously reported on the ex vivo expansion and transplantation of limbal epithelial stem cells (LSCs)  as a therapy for the pain and vision loss suffered by limbal stem cell deficiency (LSCD) patients . Additionally, the team has extended their studies to the treatment of LSCD patients with expanded ex vivo autologous oral mucosa epithelial (OME) cells  as an alternative source of autologous epithelial stem cells. While these approaches have proved successful, the authors note that the current inability to prospectively isolate pure populations of epithelial stem cells makes these protocols labor intensive and lacking in standardization. Now, a new STEM CELLS report from Bojic et al. describes new cell surface markers for two different LSC types in the hope of improving transplantation approaches for LSCD [4, 5]: CD200 as a marker for quiescent LSCs with a higher degree of stemness and CD109 for rapidly-cycling, committed limbal epithelial progenitors . The authors initially employed the LEGEND Screen™ Lyophilized Antibody Panel Human Cell Screening Kit to assess the expression of 361 cell surface proteins via flow cytometry on ex vivo expanded limbal epithelial cells and concentrated on the roles of CD200, a type I membrane glycoprotein, and CD109, a glycosylphosphatidylinositol-linked glycoprotein. The study uncovered the elevated expression of CD200 on a small subset of limbal epithelial cells and a reduction in CD2000 expression after serial passaging and induced differentiation similar to the kinetics of the ΔNp63 limbal stem cell marker. The CD200-positive limbal epithelial cell population also expressed high levels of known LSC markers (ΔNp63, PAX6, WNT7A, CDH3, CK14, CK15, and ABCB5), contained the vast majority of stem-like cells, and localized to the basal layer of both the human and mouse limbal epithelium. Interestingly, the lack of the expression of the Ki67 proliferation marker on CD200-positive cells and the loss of stem-like properties following CD200 downregulation by short interfering RNA suggested that CD200 labels a population of quiescent LSCs and that CD200 plays a crucial role in the maintenance and/or self‐renewal of said LSCs. In contrast to the CD200 pattern, the authors discovered that a more substantial proportion of limbal epithelial cells (about 50%) expressed CD109 and that CD109 colocalized with ΔNp63 within the basal layer of the limbal epithelium in both human and mouse cornea. CD109 expression also decreased during induced differentiation although these cells exhibited high levels of the Ki67 proliferation marker, together suggesting that CD109 labels proliferating corneal epithelial progenitor cells. The authors hope that these two new cell surface markers, CD200 for quiescent limbal stem cells and CD109 for proliferating limbal epithelial progenitor cells, will significantly improve the isolation/purification of these cell types and facilitate their application in regenerative therapies aimed at those suffering from LSCD. To keep up to date with all new limbal stem cell surface markers and new treatment approaches for limbal stem cell deficiency, stay tuned to the Stem Cells Portal! Kolli S, Ahmad S, Lako M, et al., Successful clinical implementation of corneal epithelial stem cell therapy for treatment of unilateral limbal stem cell deficiency. Stem Cells 2010;28:597-610. 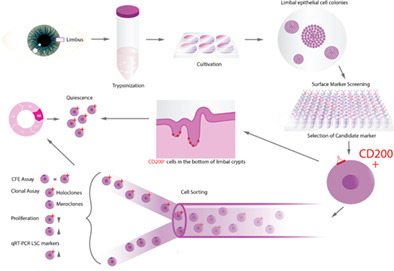 Baylis O, Rooney P, Figueiredo F, et al., An investigation of donor and culture parameters which influence epithelial outgrowths from cultured human cadaveric limbal explants. J Cell Physiol 2013;228:1025-30. Kolli S, Ahmad S, Mudhar HS, et al., Successful application of ex vivo expanded human autologous oral mucosal epithelium for the treatment of total bilateral limbal stem cell deficiency. Stem Cells 2014;32:2135-46. Goodell MA, Nguyen H, and Shroyer N, Somatic stem cell heterogeneity: diversity in the blood, skin and intestinal stem cell compartments. Nat Rev Mol Cell Biol 2015;16:299-309. Li L and Clevers H, Coexistence of quiescent and active adult stem cells in mammals. Science 2010;327:542-5. Bojic S, Hallam D, Alcada N, et al., CD200 Expression Marks a Population of Quiescent Limbal Epithelial Stem Cells with Holoclone Forming Ability. STEM CELLS 2018;36:1723-1735.